The Arlington Public Library invites you to this year’s Mayor’s Holiday Pajama Storytime, at 6:30 p.m. Wednesday, Dec. 12 at the George W. Hawkes Downtown Library. Join us for a festive evening of stories, songs, and a special craft. Children are encouraged to wear their favorite cozy pajamas and bring a stuffed friend along for the fun. “I’m always excited to meet and encourage our young learners and their families, particularly during this special time of year,” Mayor Jeff Williams said. The Mayor's wife, Karen Williams, and daughter, Suzanne Taylor, will read several fun, seasonal stories. 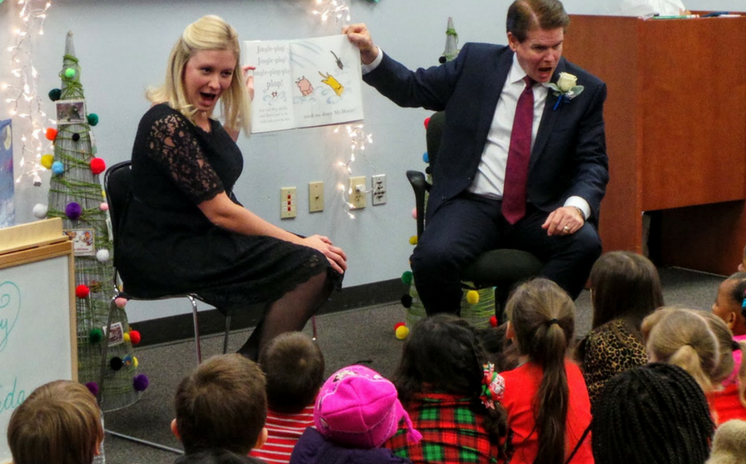 The Mayor’s Holiday Pajama Storytime is an annual event, just in time for the holiday season. The Library's regular weekly storytimes take a break in December, but the Pajama Storytime is a fun opportunity to enjoy songs, stories, and other early learning activities. The evening will also include a sing-along, games, crafts and more. Activities will be geared for preschool-aged children, but the entire family is welcome to attend. Click here for more information.